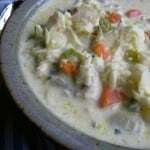 We had this yummy New England fish chowder for dinner last night. Although it was delicious, you can’t really call it traditional New England fish chowder because I didn’t use bacon and opted to add in carrots and celery! I haven’t made fish or clam chowder very often. It’s one of those things I usually ask Mom to make for me when I visit. But yesterday, for some reason, I got a hankering for a steamy bowl of the stuff and decided to give it a whirl. After consulting the 1959 version of The Fannie Farmer Boston Cooking School Cookbook (my mom’s version) and still affected by Jamie Oliver’s base soup recipe from his Food Revolution Cookbook, I took to the kitchen prepared to create a New England fish chowder of my very own. I decided to stick with the basics. Most old-time fish chowder recipes, including the one I consulted, call for just the most basic ingredients – firm white fish (such as haddock), potatoes, bacon or salt pork, onion, milk or cream, salt, pepper and butter. These can all be great additions, but I wanted the simpler kind of chowder I grew up with. I decided to forgo the bacon and use olive oil instead. And I felt like a few more vegetables couldn’t hurt, so I added 2 stalks of diced celery and 2 peeled and diced carrots with the onions and diced potatoes. Mom often makes her fish chowder with evaporated milk, which is very common in Maine. I added a touch of cream for added richness. The result was a fish chowder, I’m proud to call my own. According to my calculations, each generous 1-cup serving has about 325 calories, *8 Weight Watchers PointsPlus, *9 Weight Watchers SmartPoints. Under the new Weight Watcher guidelines for 2018, this is now *8 Freestyle SmartPoints. Enjoy! Chowder is improved if you make it one day and serve it the next, although I’ve never had the discipline not to indulge immediately. I like to make a big enough batch to enjoy for a couple of day. 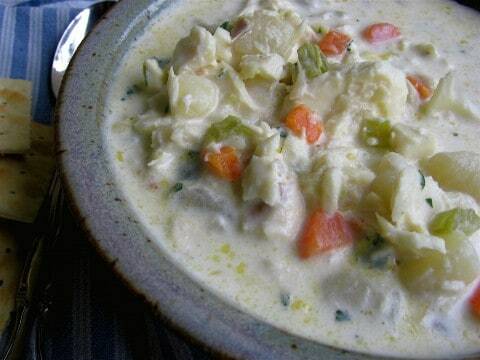 If you’ve made this fish chowder, please give the recipe a star rating below and leave a comment letting me know how you liked it. A simple Maine-style fish chowder with a thin, milky broth made lighter. Put the fish and 2 cups water in a covered skillet. Cook over medium low heat until the fish just flakes with a fork, 5 to 10 minutes (depending on the thickness of your fish). Remove the fish, reserving the liquid, and separate it into large pieces. Put a large pot on medium heat and add 2 tablespoons olive oil. Add the onion, celery, carrots and potatoes and mix them together with a wooden spoon. Cook for around 10 minutes, with the lid askew and stirring occasionally, until the carrots have softened a bit and the onion is lightly golden. Add the reserved water you used to cook the fish. Bring to a boil and then lower the heat, cover and cook just until the potatoes are tender, about 10 minutes. Heat gently, stirring often. Don't allow to boil. Add salt, pepper and butter (if desired) to taste. Cooking Tip: Chowder is improved if you make it one day and serve it the next, although I've never had the discipline not to indulge immediately. I like to make a big enough batch to enjoy for a couple of day.